President – Dr. Hja. Luningning M. Umar together with the university’s Vice Presidents during the opening of the WMSU Palaro 2011 at the Joaquin F. Enriquez Memorial Sports Complex. “I hope it provided you the mindset and values,” Dr. Hja. Luningning M. Umar, University President addressed to the student athletes during the closing ceremony of the Western Mindanao State University (WMSU) Palaro 2011. Some ten thousand WMSU students attended the closing ceremony of the said event last December 9 at the Joaquin F. Enriquez Memorial Sports Complex (JFEMSC). Dr. Umar added in her message that the WMSU Palaro 2011 is all about those things that will not be learned within the four walls of the classroom. She mentioned that teamwork, fair play, respect, adherence to rules, perseverance and sense purpose are also necessary to instill built and character in students aside from academic learnings. 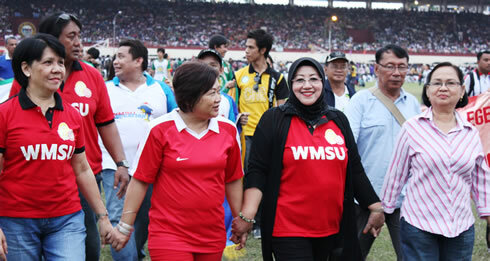 In turn, she congratulated all the student athletes for their success and active participation during the event. It was Dr. Umar’s first time to observe WMSU Palaro with the university as its President. The closing ceremony also made way for the awarding ceremonies of victorious athletes of the Integrated Laboratory School Elementary and High School Department and of the different colleges. Yielding as the overall champion in the different athletic and non-athletic events is the College of Engineering and Technology (CET) with a staggering 86 gold medals, CET outmatched 18 other colleges including the different External Studies Units (ESU): WMSU-Pagadian, WMSU-Malangas, WMSU-Molave and WMSU-Aurora. Ranking 1st runner-up to CET was the College of Nursing (CN) with 28 golds, followed by the College of Criminal Justice Education (CCJE), with 26 golds, as 2nd runner-up. Landing 3rd runner-up was the delegation of WMSU-Pagadian and placing 4th runner-up was the College of Physical Education, Recreation and Sports (CPERS). Non-athletic competitions during the Palaro comprised of the University Quiz Bowl, Oration and Extemporaneous Speaking, Talumpati, Visual Arts Contest, Essay Writing Contest, Musical Contest, Dancesport Competition and Cheerdance Competition. The Cheerdance Competition followed after the awarding ceremonies, in which the CET Hawks emerged as Champion with their breathtaking and heart-stopping stunts and dance routine. Placing 1st runner-up was the College of Social Sciences’ Lycans, while landing 2nd runner-up was the College of Nursing’s Juggernauts. Red Bombers (RBM) Zamboanga, official pep squad of Zamboanga City, was invited to do an exhibition of the latest standards in Cheerdancing competition.